Samsung is currently testing Galaxy Note8 prototypes running Android 7.1.1 Nougat. This has been revealed through the HTML5Test database, where a Samsung SM-N950F is now featured. This is widely believed to be the Note8’s model number. 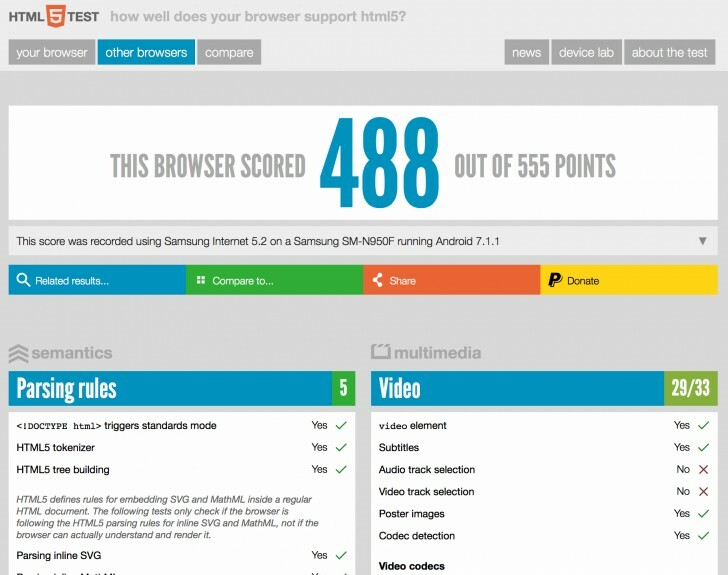 A prototype ran the test and its browser, Samsung Internet 5.2, managed to score 488 points out of a total 555. This being a prototype, of course that’s not really indicative of any real-world performance. It’s interesting however that the Note8 in question is running Android 7.1.1 Nougat, and not a newer O build. Then again, Android O is still in beta and will only be finalized by Google at some point in August. The Note8 may actually be launching that month, which means Samsung won’t have enough time to adapt it to its needs. So for better or worse, it looks like the Galaxy Note8 will arrive with Android 7.1.1 Nougat on board. We assume the update to O will follow within a few months of its launch. The Note8 has been rumored to sport the yet-unofficial Qualcomm Snapdragon 836 chipset, a dual rear camera setup, a 6.3-inch Infinity Display, and a design that’s highly reminiscent of the Galaxy S8 and S8+, but obviously with an S Pen added in for good measure.